I think I lost my mind today, at Target. I was whizzing through there (and by “whizzing” I mean shopping for a couple of things very quickly…NOT relieving myself through the aisles) this afternoon with the twelve-year-old and we headed for the soda aisle. We headed for the pop aisle. Anyhoo, let me get back to my story. And–Wha?? ?–it’s a Limited Edition! I don’t know what the hell that means when it comes to soda that is being sold in a plastic 2-liter bottle, but it sounds very important! Fast forward to dinner time. Yay! Time to try the Limited Edition Diet Cherry Chocolate Dr. Pepper! Tastes like chocolate air freshener. Whose stupid idea was this, anyway??? OMG I almost peed myself reading this post. 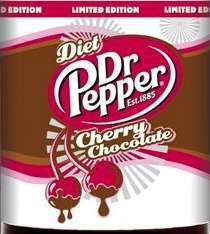 It sounds so delicious yet so artifical…The hubby is a huge fan of Dr. Pepper too. I was so jealous reading this post b/c I gave up ALL soda 2 years ago – COLD TURKEY – and I LOVED LOVED Dr Pepper…..I was sighing and oooooohing at the thought of choc and cherries….